When it comes to riding mats on bags of air, mat riders might like to see themselves as being specialists, but our art has a long and interesting history. 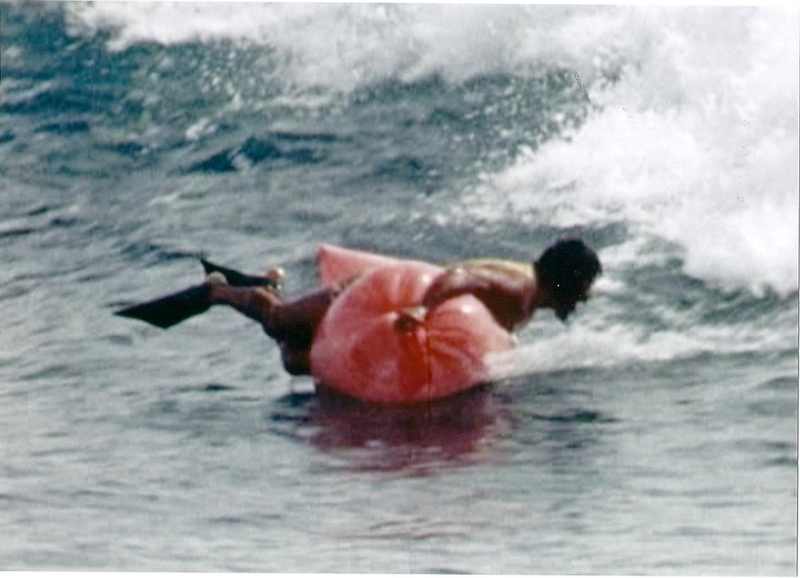 One of the most fascinating incarnations of inflatable surf riding has to be that of Bag Surfing. We were stoked when Rod Rogers over at mypaipoboards.org put us in touch with renown Hawaiian Surf Historian John Clark. John is the author of many books on the History of Hawaiian Surfing and Surf Culture which are available on Amazon. He was also kind enough to share his memories of the the man who pioneered Bag Surfing in the first place, Al Santos. John's email to us follows and we would like to say a big thank you to John for his generosity. Thanks for the link to your website. I enjoyed going through it. I’ve seen the modern surfmats in action here in Hawaii, but I’ve never tried one myself. They look like they’re pretty fast. In 1972 while I was a lifeguard at Sandy Beach, I helped to start the Sandy Beach Bodysurfing Championships. Mat surfing was popular then, so we had a mat surfing event in our contest, which I documented in my book, Hawaiian Surfing. Paipo boards maintained their widespread popularity into the 1970s, most of them made at home or in middle and high school wood shops, but when Tom Morey introduced the Morey Boogie board in 1973, it was the beginning of the end for the wooden bodyboards. Boogie boards were so popular that by the early 1980s, they had almost completely replaced paipo boards. One of the best indicators of the change were the events at the Sandy Beach Bodysurfing Championships, a contest that ran from 1972 to 1994. During the early years of the contest, the organizers, the Hālona Point Bodysurfing Association, had categories for surf mat and paipo surfing, besides the bodysurfing events, but in 1976 they dropped the mat event and added a “boogie board” event. In 1978, they offered a second boogie board event for women, and in the early 1980s they dropped the paipo event. I was the head judge for the Sandy Beach contest for 18 years, so I judged the mat surfing event as long as we ran it. I don’t have any photos, but Gordon Smith, one of the best mat surfers back in day, is still around, so I’m going to try to contact him and see if he’s got anything. I’ve attached a scan of one of our early programs, which lists Gordon as a two-time winner of the mat surfing event. I also wrote about bag riding in Hawaiian Surfing and Al Santos, who was the best bag rider I’ve ever seen. Santos liked bag riding the best, especially surfing on his inflated bag. — Al Santos. March 12, 2003. In 1965, Santos started designing his own bags, which were sewn by his wife, Kitti. His custom bags improved his skimming and surfing, and he started bag riding at Sandy Beach, where he not only rode the waves in the shorebreak, but also the waves at Generals, the big second reef break outside the shorebreak. Santos would put on a pair of Churchill fins, inflate his bag, swim out to the lineup at Generals lying on his bag, catch a big wave, and ride all the way into the beach, often doing 360-degree spins on the way in. An amazing athlete, he was always asked to perform during the annual Sandy Beach Bodysurfing Championships. — Sunday Star Bulletin & Advertiser. mar 12, 1978. p. h-6. Santos, who was featured in Red Hot Blue, a surf movie by Curt Mastalka that premiered at Roosevelt High School in 1973, was the last of Hawai‘i’s bag riders. He hung up his bag and his fins in 1989 when he retired to the town of Volcano on the island of Hawai‘i. Al Santos is a personal friend. He gave me the stills, which I’ve attached [Ed: Featured in this article]. Please feel free to use them on your website. These include screen shots from the Red Hot Blue surf movie [Ed: See the 360 sequence above] that are in my Powerpoint presentation in a separate email. If you’re interested in seeing the original movie footage, you can find copies of Red Hot Blue for sale online.